On 26 July 2014, Vietnam Foundation members and friends attended as guests at a special concert by the Guihangtar Duo hosted by the The Vietnamese Australian Scientists and Professionals Association (VASPA) at the University of New South Wales, Kensington Campus. Guihangtar is an expression of tradition, innovation, and global interaction. Comprising guitarist Le-Tuyen Nguyen (Australia) and percussionist Salil Sachdev (USA), the musical duo group initially emerged as a potential collaboration incorporating the guitar and the Hang (a percussion instrument invented in Switzerland in 2000). However, Guihangtar’s maiden concert in 2010 evolved to include other percussion instruments as well. The duo performed compositions and arrangements inspired by nature and traditional music not bound by cultural confines. Traditional melodic and rhythmic idioms weaved with Western music exploring the technical and expressive dimensions of the guitar, enhanced with percussion instruments from various parts of the world. 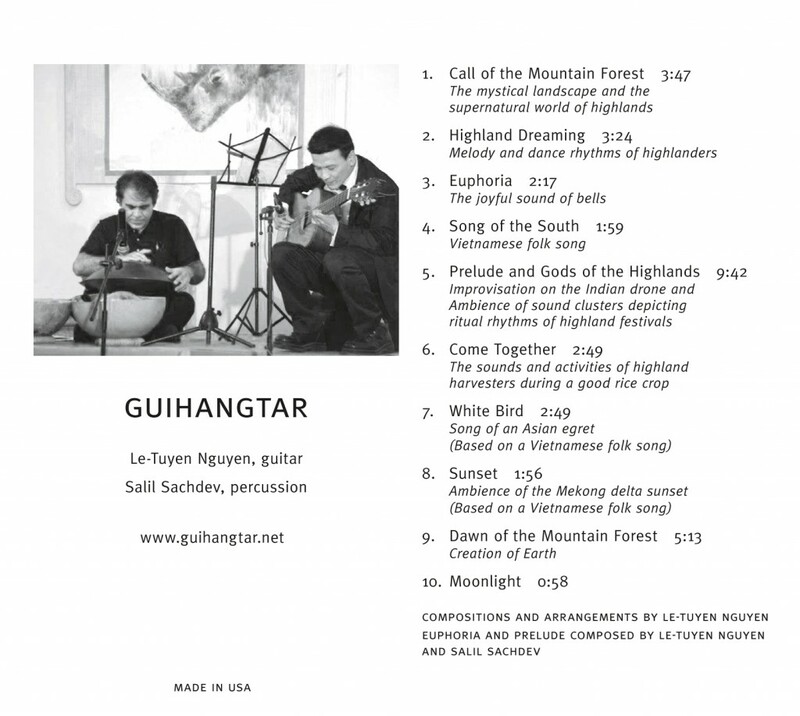 Guihangtar’s album Dawn of the Mountain Forest is now available both in CD and MP3 downloads. CD available at Guihangtar official webpage: http://www.guihangtar.net/#!buy/c2250.